Hiya guys! It's almost time to kick back for the weekend and I definitely need the break. I know I've been a little quiet on social media this week, but it's been hell. I seriously don't know what I would do without my little mani cave to brighten my day. Emphasis on the bright when it comes to this post. 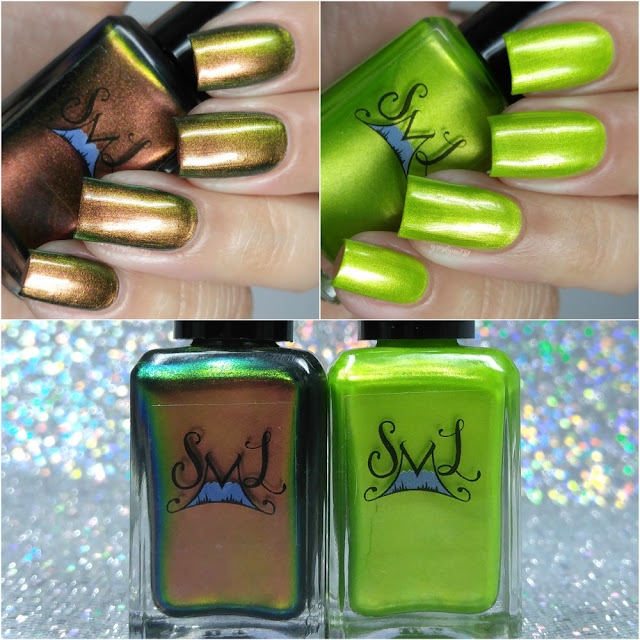 Today I'm sharing swatches for the magical St. Patrick's Duo by Smokey Mountain Lacquers. A little warning... you're going to need either a drool bucket or a napkin ready because these are drop-dead gorgeous. Haha. Let's go ahead and get to the swatches! The St. Patrick's Duo by Smokey Mountain Lacquers will be releasing tomorrow Friday, February 17th at 7PM CST. Each duo set retails for $17 for full size and $12 for mini size. This is a limited edition duo and will not be available for purchase individually. Fool’s Gold can be described as a chrome chameleon that flashes between copper, gold and green. Look at that shift! I'm absolutely just living for this color. By far one of my favorite shades from SML and will likely be on my roundup for 2017 as a whole. I'm SO thankful my camera decided to cut me some slack and capture all the beautiful shifting. The formula has a really opaque and smooth application, it's almost a one coater. Amazing coverage and consistency, really glides on so effortlessly. It dries to a high shine on its own as well. Shown here in two coats and sealed with a glossy topcoat. 2 Sheets To The Wind can be described as an apple green cream with subtle gold shimmer. The brightness is lighting up my soul... Okay that was a little too emo, but you get where I'm going with this. Seriously though, I was not expecting so much limey pop from this shade. But I'm loving it! Heck, it looks stunning against my skin complexion. And let me tell you that is definitely not an easy feat for a bright green. The formula has an initial sheer application, but builds-up flawlessly to an opaque finish. It has such a great consistency, not too thick or too thin. So smooth! There are minimal brush strokes visible in the finish, but most blend out after topcoat. Shown here in two coats and sealed with a glossy topcoat. Overall I cannot begin to describe how completely blown away I am at these polishes. And this is coming from someone who does not normally like green shades. I feel like I had to hold back on the gushing throughout this review, but really I was more than a little excited about these. The formula really just blows my mind, I gotta say these are both must-haves for any collection. Even if you're on the fence about the color green (I know it tends to not be a crowd favorite) trust me you need these! To recap, the St. Patrick's Duo by Smokey Mountain Lacquers will be releasing tomorrow Friday, February 17th at 7PM CST. Each duo set retails for $17 for full size and $12 for mini size. This is a limited edition duo and will not be available for purchase individually. So tell me you guys are as crazy as I am for these shades? Will you be grabbing your pair tomorrow? Let me know down in the comments! Gah! The green polish lover in me is absolutely DYING for these 2 shades!! !